Nothing beats saving a few bucks on that next vacation. Now when you combine certain offers you can in fact get a cheaper deal on your Disneyland Spring Break getaway! Read on to learn more. Those taking DFDS Seaways ferries to France for a Disneyland Paris trip this spring will find it's raining offers! 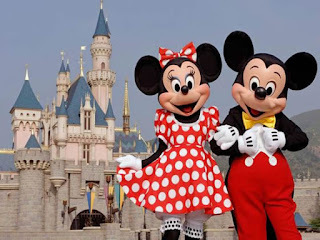 A Disneyland trip to Paris this Spring could be the cheapest when you combine these offers – Disneyland Spring Summer 2013 Early Booker Offer and DFDS Seaways Spring Special Offer. Disneyland comes up with many special offers all through the year availing which means big savings! For fabulous spring savings, avail Disneyland Spring Summer 2013 Early Booker Offer! Under this Offer, a two, three or four night break to Disneyland Paris in Spring or Summer could get you two nights and two days absolutely free when you book by 31st January 2013 for stay between 28th March - 31st August 2013! Those planning a weekend spring break can avail Disney's Weekend Offer and can save 30% on 4 days/3 nights stay at Disney's Davy Crockett Ranch from 29th March to 1st November 2013 for arrivals on Fridays. There is limited availability of cabins per arrival date, so plan your trip early. This offer can be combined with "Free Hotel & Park tickets for kids under 7" for arrivals until 1st November 2013 for each adult package booked.Disneyland Spring Break could be the cheapest when you combine Disneyland offers with DFDS Seaways Special Ferry Offers. DFDS Seaways has some excellent special offers for Spring travel that could make a Spring Disneyland trip to France even more affordable. Visitors to Disneyland when they choose to travel with DFDS Seaways, can save 20% off the normal economy fare if they book their Channel Crossing 2013 before 14th January on sailings from 7th January to 20th December 2013. Travellers looking for cheap ferries to France can also opt for a short break offer on ferry travel between Dover and France and make big savings.What better time to visit Disneyland, Paris than Spring when it's raining offers! DFDS Seaways is one of Europe's leading ferry operators offering both passenger and freight services across the English Channel, the North Sea and the Baltic Sea.DFDS Seaways has several awards to its credit, and in 2012, the company was named “World's Leading Ferry Operator” by World Travel Award, the sixth consecutive time the company is honoured with this most prestigious award in the travel industry. Across the English Channel, DFDS Seaways operates the most ideal ferry routes to France – Dover to Dunkirk and Dover to Calais. The modern ferries come complete with bars, restaurants, kids play areas and onboard shopping. Affordable rates and an incredible choice of sailings are the prime reasons for DFDS Seaways to be a preferred service provider across the English Channel.